In 2016, the Netherlands-based Technical Centre for Agricultural and Rural Cooperation (CTA) invited me to visit the Caribbean to explore how the region was tackling two distinct – but unrelated – crises. On one hand, the failure of governments and the private sector to invest more heavily in the agri-food sector had meant that the region’s food import bill had become dangerously high. On the other, levels of obesity and non-communicable diseases had steadily risen, largely because many people were eating too much of the wrong sort of things: processed products and calorie-dense foods high in fats and sugar, much of which was imported. 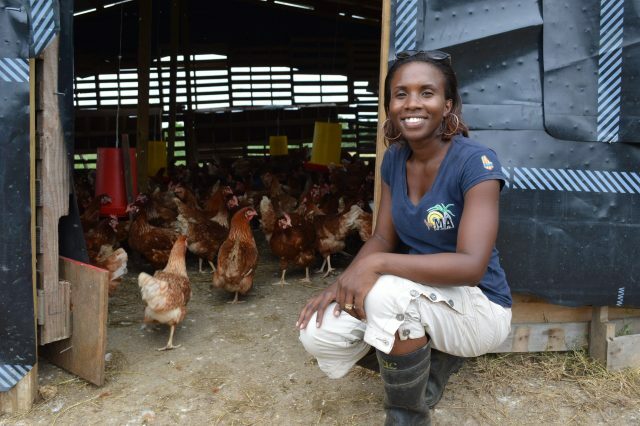 Joanna Waterman is supplying several chefs in Barbados with free-range eggs and a range of vegetables. She also sells lamb from her Barbados blackbelly sheep. After attending the 14th Caribbean Week of Agriculture in the Cayman Islands (a great opportunity to meet politicians and policy-maker) I spent time with CTA’s partners in Jamaica, Trinidad and Barbados. I talked to farmers and chefs, to agricultural extension agents and food processors, as well as others involved in the food business. The result was Strengthening Local Food Production and Trade in the Caribbean, which you can download here, free of charge, from CTA’s website. Just to give you a taste, here are some excerpts from the introductory chapter. Although the 15 countries belonging to the Caribbean Community (CARICOM) have made some progress in reducing undernourishment, levels of obesity have risen dramatically. A 2014 study by the Pan American Health Organization (PAHO) found that 30% of children between the ages of 11 and 13 years in four Caribbean countries were overweight. In Barbados, the number of overweight or obese children doubled during the last decade. The situation among adults is just as depressing. Take, for example, Jamaica. Just 9% of the population between the ages of 15 and 75 years were obese in 2000; this figure had risen to 25.3% by 2008. Non-communicable diseases, including type 2 diabetes, cancers, heart attacks and strokes, now account for over half of all deaths in the Caribbean, and most can be attributed to poor diet and lack of exercise. Talk to older people in the Caribbean and they will tell you that when they were young they had a relatively healthy diet, based on fresh local produce. Those days are long past, with most countries becoming progressively less self-sufficient in fresh food and more reliant on imports of processed food. The food import bill in 1990 was US$1.4 billion. It had risen to US$4 billion by 2010 and if present trends continue it will exceed US$8 billion by 2020. 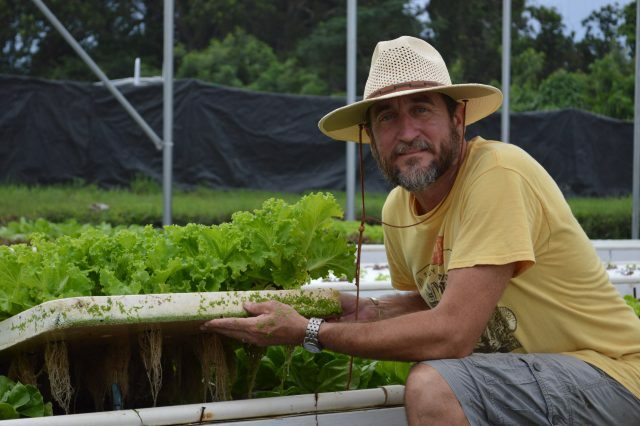 Richard Archer’s aquaponic business produces 16,000 heads of high-quality, organic lettuce each week for the high-end restaurant market in Barbados. There is nothing controversial about these views; they are widely held in the agricultural sector. 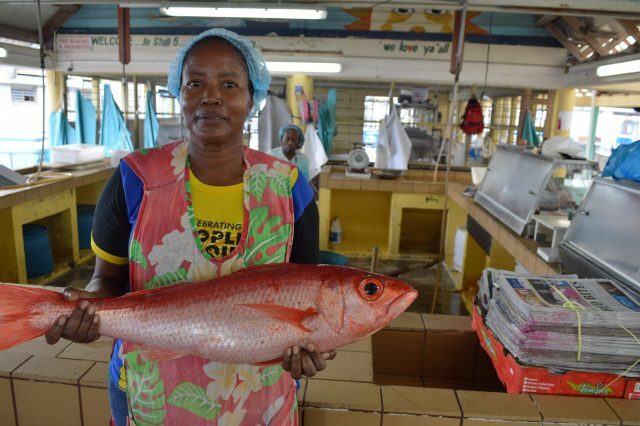 As a response to rising import costs, volatile food prices, environmental challenges and the health crisis, CARICOM countries have agreed to focus on developing and promoting specific sectors: roots and tubers, small ruminants, fruits and vegetables, herbs and spices and crops like breadfruit and plantain. The aim is to increase domestic production and reduce imports. This presents a great opportunity for Caribbean farmers. According to the Caribbean Farmers Network (CaFAN), small-scale family farmers – the vast majority of farmers in the Caribbean have less than 2 ha of land – currently produce 60% of the region’s home-grown food. They could play a major role in increasing local food production and creating greater prosperity in the countryside, where almost half the population live. The first story in the booklet illustrates how governments can play a significant role in increasing home-grown food production. At the time of the 2008 financial crisis, when global food prices peaked, Jamaica’s import food bill was US$800 million a year. The government decided to focus on increasing the production of certain commodities, one being the Irish potato. In 2008, Jamaican farmers were meeting just 30% of local demand. The country is now well on its way to being self-sufficient in potatoes. Fresh fish for sale in Bridgetown. The second story focuses on import substitution in Trinidad and Tobago. In 2007, the Trinidad and Tobago Agri-Business Association (TTABA) was given the task of managing the government’s National Agri-Business Development Programme. The programme had a major influence on food production and TTABA significantly increased the sale of locally produced, and processed, crops such as cassava, sweet potato, plantain and pumpkin. The story told here looks at the efforts to encourage bakeries to use cassava as a substitute for imported wheat flour. The final story, set in Barbados, focuses on agritourism: on linking farmers and agribusinesses to the tourist market. Traditionally, tourist establishments have employed expatriate chefs and served menus based on Western culinary ideas, using mostly imported food. During recent years, a growing number of establishments have begun to source their food, including indigenous crops, locally. This is creating new markets for farmers and injecting money into rural areas. It is also helping to reduce the food import bill. A similar story could be told for many other Caribbean islands. CTA is a joint international institution of the African, Caribbean and Pacific (ACP) group of states in the European Union (EU). Towards the end of last year, the Technical Centre for Agricultural and Rural Cooperation (CTA) invited me to attend a forum in Apia, Samoa, which focused on ways to link the food sector to local markets, with the aim of enhancing economic growth and improving food and nutritional security in the Pacific. The forum was attended by politicians, civil servants, chefs, farmers’ representatives, academics and others involved in the food industry. Besides interviewing many of those attending the agribusiness forum, I visited chefs, restaurant owners and farmers on the island of Samoa.